Plot: On the run in the year 1987, Bumblebee finds refuge in a junkyard in a small Californian beach town. Charlie, on the cusp of turning 18 and trying to find her place in the world, discovers Bumblebee, battle-scarred and broken. Starring: Hailee Steinfeld, John Cena, Pamela Adlon, Kenneth Choi. 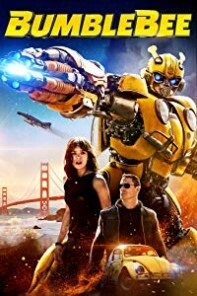 distributed by Paramount «Bumblebee» in the US movie theaters released on December 21, 2018 and has grossed over $458 million worldwide; dvd and blu-ray release date was set for April 2, 2019. Rent from Netflix and Redbox from April 2, 2019. «Bumblebee» in the UK released in movie theaters on December 26, 2018. DVD and blu-ray release date scheduled for May 13, 2019.